Earlier, before developing the Java language, programmers used to face many challenges while porting the software from one operating system to the other and then running an application on the converted OS would take more time than developing that application. With the evolution of internet, this problem of software breaking has become worse. Later in 1995, the Sun Microsystems has released the Java language, which can run the applications on different platforms easily. Java provides the same look and feel of an application regardless of the operating system choosed. 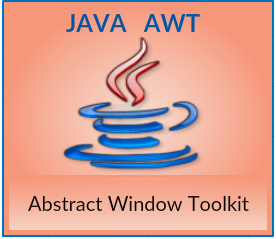 This constant portability of JAVA can be achieved by using a package called AWT which stands for Abstract Window Toolkitand is platform independent. The interface between the user and application program is known as an user-interface. A user-interface has multiple forms, which ranges from commands to graphic clicks. In low-level operating systems, the user has to communicate with the commands to interact with the application. Now, a user can interact with the application in just a click by tracking the mouse and reading the keyboard. 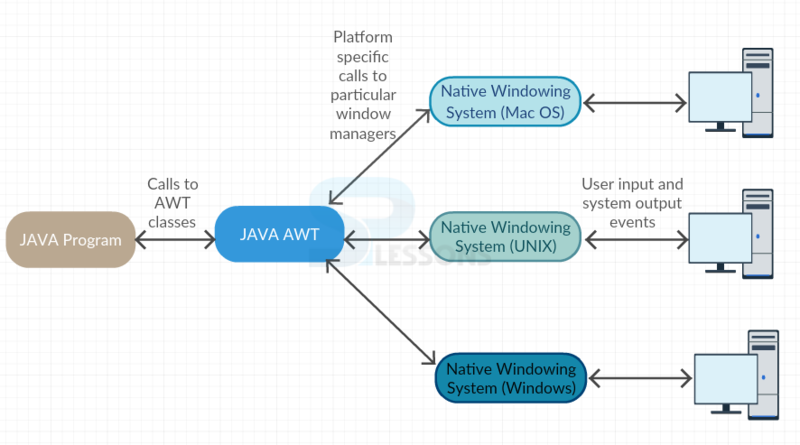 Abstract Window Toolkit provides a better object-oriented interface to these low-level operating systems by developing its design and the performance. AWT has a set of tools that are used in various platforms by including them in the graphical user interface(GUI). Every platform has its GUI Toolkit and the interface elements enhances the look & feel of the applications. 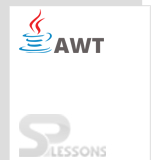 AWT elements like Window, Frame, Panel, Button, Textfield, TextArea, Listbox, Combobox, Label, and Checkbox will be explained in the next chapters. But, for further proceeding, one should have a knowledge of Java programming, executing programs, and text editors like notepad. The main drawback of using AWT is that the GUI interface designed on a platform may change its features when displayed on the other platforms and is a heavy-weight application because it has to communicate with the operating system for its resources. This makes AWT less popular these days. AWT stands for Abstract Window Toolkit. AWT elements interact with the GUI interface.